‘Shadowhunters’ BTS Photo: PanDEMONium is Coming! With filming on Shadowhunters set to begin tomorrow in Toronto, fandom excitement is already at a great high. Executive producer McG added fuel to that blazing fire of excitement with a new behind-the-scenes photo featuring Dominic Sherwood and Matthew Daddario rehearsing for the Pandemonium scene as Katherine McNamara looks on. Could the famous Pandemonium scene — the one that started it all — be where production officially begins? 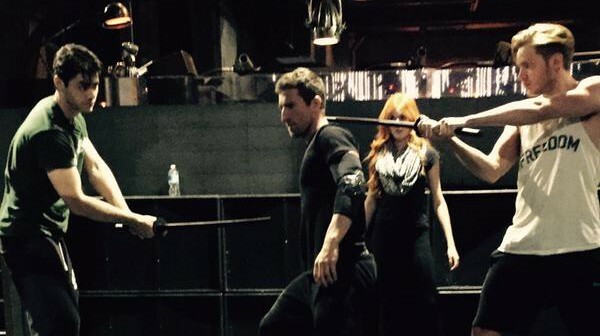 9 Comments on ‘Shadowhunters’ BTS Photo: PanDEMONium is Coming! Where it all began. Where it got me hooked. I cannot wait! The excitement is real! I cannot wait for this! AAARRRRGGGHHHHHH!!!!! *flails* I AM SO EXCITED!!!!! LOVE LOVE LOVE LOVE LOOOOOVE THEM!!!!! They really know how to drive the fans crazily excited for the show. Wonder who the guy is who’s portraying the demon? In the book Izzy entices him, then she and Alec restrain him while Jace takes him out.